West of Scotland Juniors stole the show with a flurry of gold medals, but were denied a all the titles by Tayside & Fife last weekend. 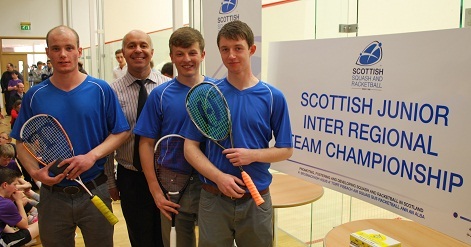 The first ever event at Scotland’s 2014 Commonwealth squash facility saw 108 players, representing the country’s best juniors, meeting at the new courts at the Scotstoun in Glasgow. For Tayside & Fife, last year’s winners Elspeth Young, Craig Valente-Wallace and David Beaumont stepped up an age group and along with Calum Johnston and Rory Irwin denied the West a full winning streak again. The gold medal decider was against the West and after losing the first two matches, Tayside & Fife had to win the final two to win the title. David Beaumont & Elspeth Young stepped up to the challenge and took both matches 3-0. David Ward, Chairman of SSRC (the oldest members squash club in Scotland), presented the prizes at what is hoped to be the first of many events at the Scotstoun facility.